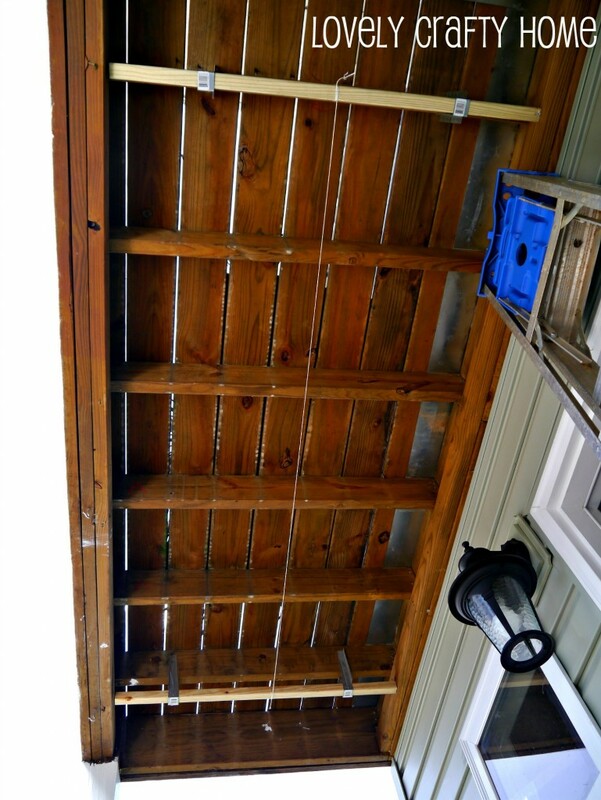 I first mentioned our plans to add a ceiling to our front porch back in February, and it’s been a slow process (mainly because of rainy weather and needing help from the hubs on the weekends- oh and the fact that I can’t ever finish anything I start). P.S. This ran me about $85…MUCH CHEAPER than any other DIY kit solution I found and certainly cheaper than hiring a pro. 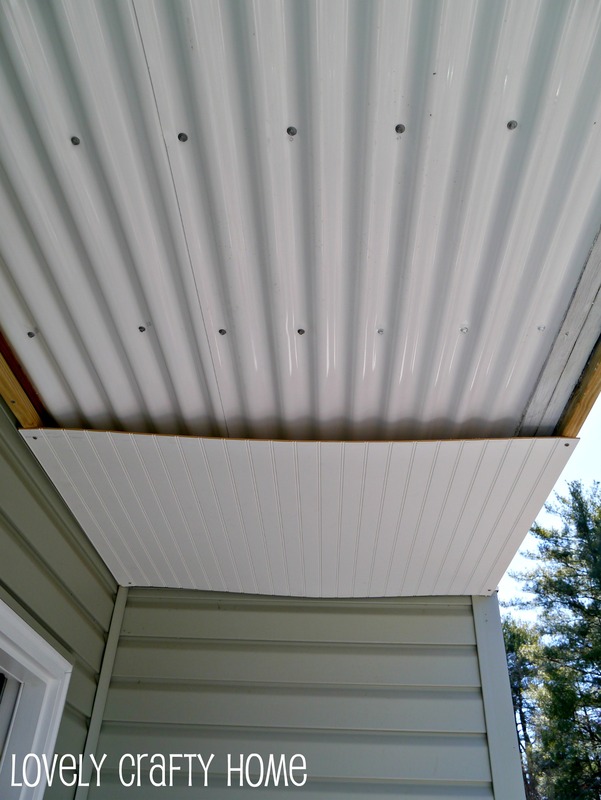 The principle here is simple: the panels are installed on a slight grade which allows water from the top deck to fall through and drain off. Since we didn’t want the water to fall towards the stairs (how nice would that be to walk into?! 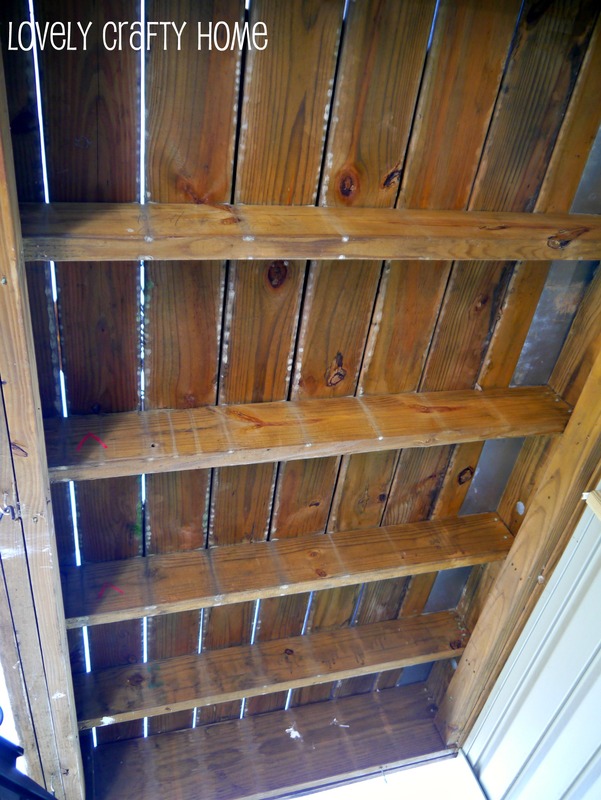 ), we decided to slop the panels towards the left side of the ceiling (facing the house, as shown above). The first step is to take a lot of measurements. You need to get enough sheets of Palruf to cover the whole underside of the deck. For us, that was just (2) 12 ft panels. Each panel measures 26″ wide because they expect you to overlap them by 2″. Once you determine how many sheets you’ll need to cover the area, now it’s time to determine how you’ll run your 2×2 strips so you can buy enough lumber. 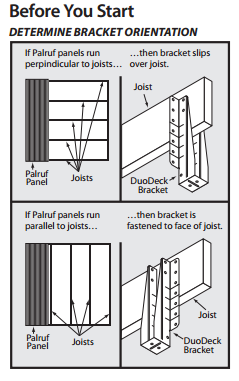 The installation guide shows the two ways to orient the brackets, just choose which scenario matches your deck. We were planning on running on panels right to left (in the photo below, that’s top to bottom), which makes ours the top scenario. 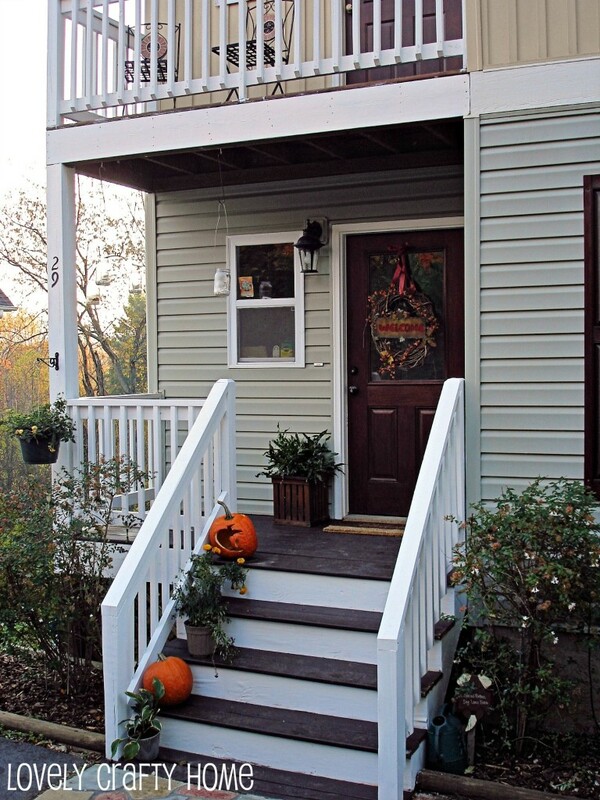 The installation guide recommends a slope of 1/4″ for every 4′ in length. 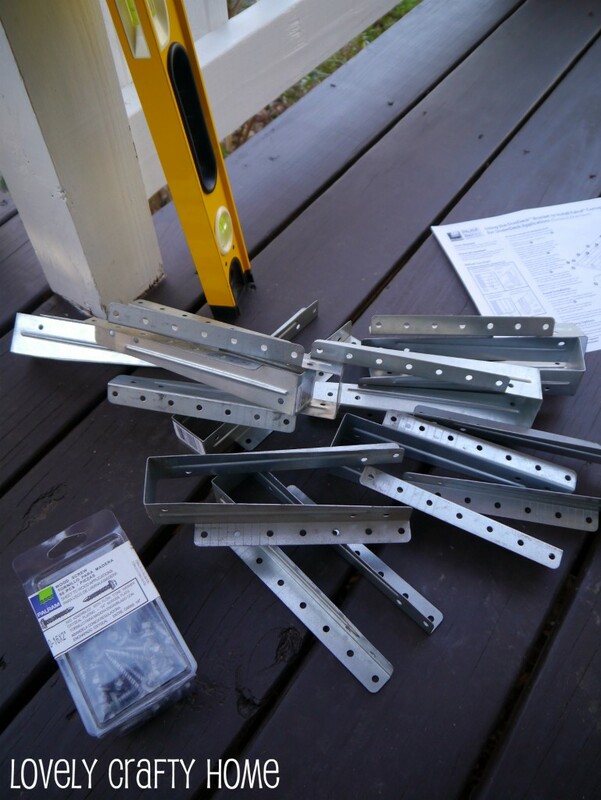 They also recommend placing brackets no further apart than 32″. I won’t go into too many details about this part because it will be different for every application, but the best way to create a constant slope over distance is to use a piece of string. If you’ve ever done any patio work, it’s very similar. Basically attach one end of the string to your highest point. Then calculate your total drop (for example, 8′ would need 1/2″), and attach the other end of the string at that height at the furthest point. We installed the beginning and end brackets first and attached the string between them. 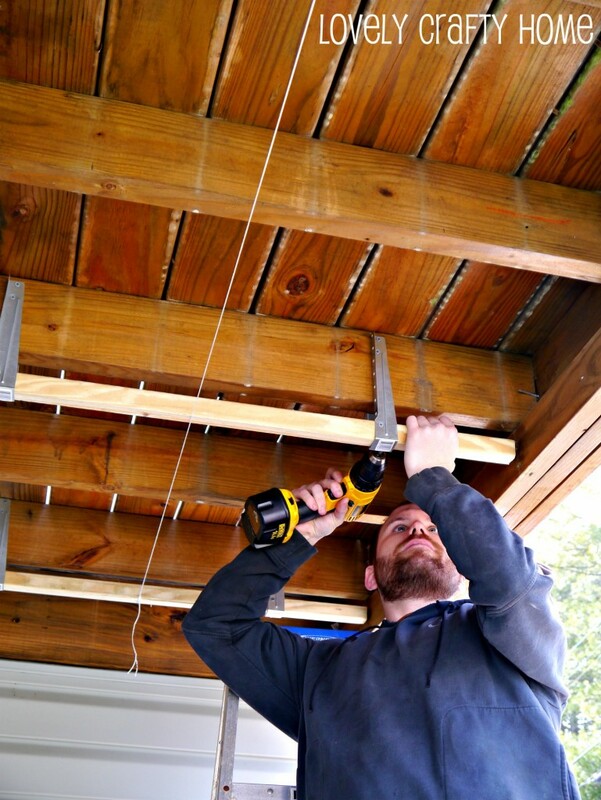 We used 2 brackets on each joist (our deck is only 4′ wide, so that was plenty of support for the 2x2s). When you go to install the middle brackets, just use the string as a guide for your hanging height. 1) You need a lot of hands. We were working with 12′ panels and cut them down to about 9′ for our deck. That was still pretty long for the two of us to wrangle. It’s hard to clamp, but we had to try…it would have been much better to have 2 more people on ladders. 2) Since you have to overlap the panels, leave the outer edge hanging (it will be secured together with the next panel). We were so focused on putting screws in to hold it in place that we forgot this seemingly obvious fact and had to remove screws. 3) The Palruf screws are designed to be self sealing…clearly we are trying to waterproof here. So be careful when you put the screws in, so you don’t end up with a piece of Swiss cheese. But, if you make a mistake don’t panic- just get some exterior caulk and fill the holes. Once you tame your panels into submission, you should have something that looks like this. Get out your caulk gun and some clear or white exterior silicone and caulk all the edges. I did A LOT of this because I had some more work in mind that required this to be super watertight. Now if you have a nice large area or a higher ceiling, I do believe that this would look pretty nice on its own. 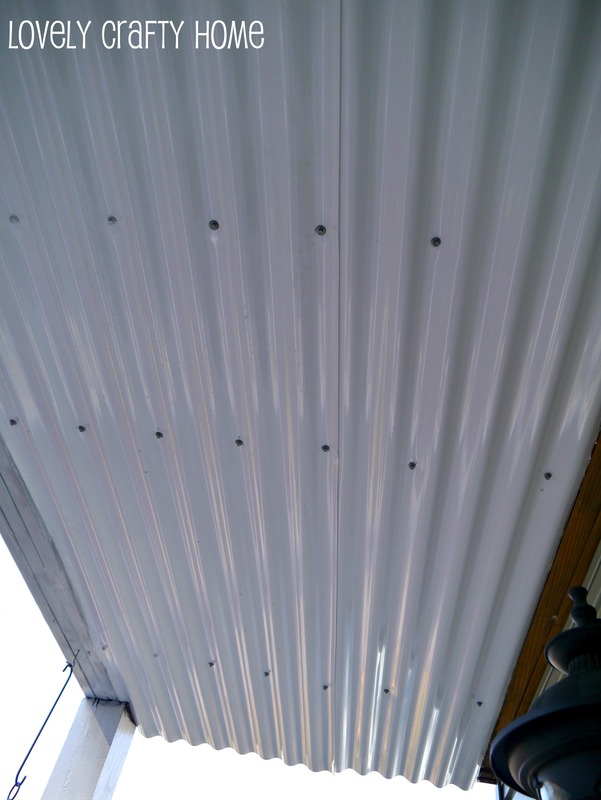 You can paint the screws white and the seams will disappear over the length of the deck. And if this was out back, I probably would leave it and call it a day. But, this is our tiny 4′x9′ front porch, so I had other plans to finish the space off. Because of the weather being so hit or miss, we’re still working on it, but I’ll give you a sneak peek. Ok, I know it looks a little crazy right now. I’m actually farther along than this picture shows, so I promise it’s looking better. The cat’s out of the bag, 98% of my projects start out as epic fails. Some of them even end that way. You heard it here first, folks. I’ll be working to finish this project this week hopefully, with some help from the hubs on the weekend. So stay tuned for more ceiling progress! OH and don’t forget to enter the Scentsy giveaway! It ends Thursday! My husband and I used the UV clear panels on our side porch. We have a slated ceiling over part of the porch so an awning could be attached. It was always getting wet so we bought the Palruf and he laid it in short panels sloped toward the awning. It worked out great. 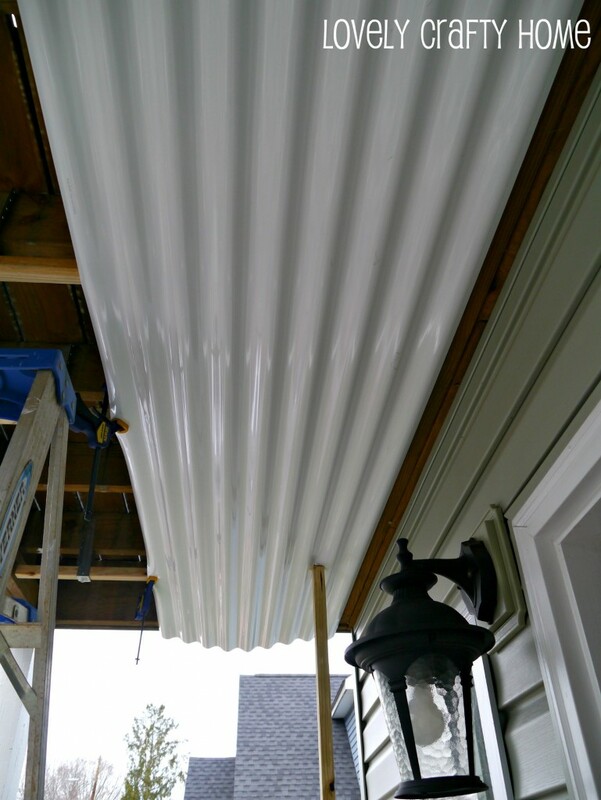 It keeps the main part of the porch dry and it allows the light to come through. We love it! how did your project end up?